Dryland Training has become a quintessential aspect of swimming. Not only does dryland provide the opportunity for athletes to become stronger but it also provides an avenue for the body to create improved physiological adaptations resulting in more functional strength and faster times in the water. The barbell deadlift is an exercise that requires an athlete to move a heavy load from the ground in a squat position by extending the lower back, knees, hips, and ankles resulting in the activation of many larger muscles of the body (Stock & Thompson, 2014). It has been shown in previous studies that the deadlift is an exercise that allows for trained individuals to lift heavier weights compared to other free weight exercises (including Olympic and Powerlifting Exercises) (Swinton et al., 2011). A study by Stock, Brennan, & Thompson in 2014 looked into the submaximal motor unit recruitment rates in two quadriceps muscles called the Vastus Lateralis and Rectus Femoris after Barbell Deadlift Training. Twenty-six men volunteered for this study. At least six months prior to this study they had refrained from doing any lower body strength training. Half of the men were placed into a control group where they were further refrained from performing lower body strength training. *Strength Training was performed twice per week with 48 hours of rest in between. *Maximal loads were not measured, instead submaximal loads of 5 repetitions with uncompromised technique were measured. *Isometric Force Testing was performed using a knee extension machine to test submaximal load. *Surface EMG’s were placed on the Vastus Lateralis and Rectus Femoris during submaximal contractions. * Muscle Voluntary Contraction showed an increase in the experiment group. * No other results expressed a statistical significance in motor firing rates in both the Vastus Lateralis and Rectus Femoris. The results demonstrate nothing statistically significant. However, the values that were displayed in the results were in agreement with previous research. The results show that conventional deadlift training does not increase firing rate in both the Vastus Lateralis and Rectus Femoris. Although this study did not find any significance in their results, the big takeaway is that the barbell deadlift is an effective exercise to build strength and power. This was the first study of its kind that focused on two specific quad muscles. Past studies have used randomized control designs and focused on weighted machines than a free lift movement. The barbell deadlift is an exercise that focuses on building power and strength. It can improve balance, proprioception, and coordination via a large range of motion (Swinton et al., 2011). This can be further used in a vast population since it works on everyday functional movement. 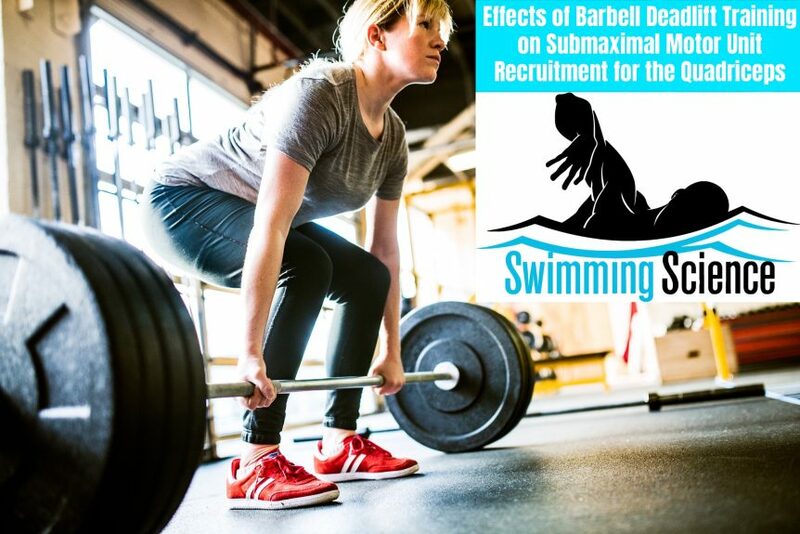 In swimmers, the deadlift,if done correctly, is an exercise that can be used to build even greater strength for movements such as starts and turns. There is even potential for this exercise to help build strength for swimmers to balance and stabilize in the water. However, due to the complexity of the exercise, coaches must be either well versed in coaching the deadlift or have a trained professional teach this movement. Improper coaching and technique can result in injury to areas such as the low back, which is a sensitive region of the body. There are other lower impact exercise alternatives to targeting these muscle groups such as Hip bridges, Single Leg Hip Bridges, Hip Thrusts, Single Leg Hip Thrusts, Band Pull Throughs, Single Hip Hinge Variations and Kettlebell Swings. These alternatives are just as effective and have less impact on the body, and one can achieve similar results. Overall, the deadlift is a great exercise that is highly effective but poses certain risks, so coaches should be mindful of the potential dangers when using this movement. Stock M, Thompson B. Effects of Barbell Deadlift Training on Submaximal Motor Unit Firing Rates for the Vastus Lateralis and Rectus Femoris. Plos One. 2014; 9(12): 1-18. Justin graduated from the University of Puget Sound in the Spring of 2018 with a degree in Exercise Science. As a young man Justin dabbled in many sports but he quickly turned to swimming. He was able to walk onto the University of Puget Sound swim team where he began to develop a studious mindset to the sport. After doing weight training, he began to become curious about the importance of strength training which developed his interest with finding ways to help others through fitness. He has interned at places such as the Riekes Center in Menlo Park and is currently interning at COR. Justin grew up in the Bay Area. When he has time he’ll either be found going on a foodie adventure, catching (or attending) as many Warriors games as possible, hoping in for a quick swim or trying out a fun new recipe. If transferof training is specific, in what way will this exercise help swimmers? I don’t believe that there is any research that shows that strength gains via weight training actually helps swimmers. Yes, I know, everyone does it! But that doesn’t mean that it is actually helping. This study did not use swimmers and did not test starts or turns before or after the study. How then can the author project that it will help swimmers. Not to menntion the fact that there was no statistical significance regarding the results. Case closed. Why would they focus on measuring the quads in a deadlift? The dominant muscles in the proper deadlift are the glutes and hamstrings (posterior chain activation). Can you point me to any studies conducted where the study sample were females and not male? In which stroke I mean free,back,fly or breast stroke deadlift is more helpful for speed?